One of these is treasured, one of these were killed! The color white has always been associated with strength, purity and with conquest. Roman conquerors used to ride a white horse when they entered a vanquished city. Napoleon and other would be world rulers rode in triumph upon white horses. 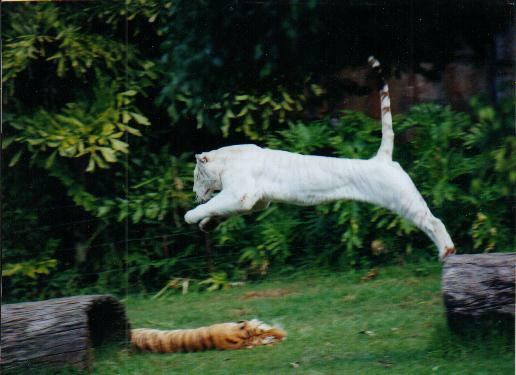 We treasure the rare white tigers. Sadly however, when it comes to white German Shepherds the opposite is true. Since the Nazi Party who took over the Verein fur Deutsche Schaferhunde or SV, the GSD breed society in Germany begun by Max von Stephanitz in April 1899, the colour white in GSD’s was seen as undesirable. Hitler thought that the white genes brought about colour fading in coloured dogs. We know now that the colour fading gene is a different gene to the white recessive gene. The reason behind the exclusion of white as a legitimate GSD coat colour has come about through an error regarding the white colour and it time to correct this error. It is too easy to disregard the whites and use the excuse that “we accept the German standard” without looking into the reason why the German standard came to exclude the whites in the first place. It is time the Breed Standard was changed to include all coat colours, as long as the colour is not linked to any health problem (and white isn’t). nor a degenerate. . . . . . "
WHERE DID THE WHITE (GERMAN) SHEPHERD COME FROM? CAN A WHITE GERMAN SHEPHERD BE BRED WITH OTHER COLOURS OF THE GERMAN SHEPHERD? older breeds of shepherds through the Phylax Society, buys Hektor Linksrhein. was in German; subsequent editions were translated into English. Germany begins a campaign to outlaw the white dogs. become undesirable due to their coat colour? Shepherd, using dogs that combined the bloodlines of the older varieties. to us is the fact that he described the guardians of the flocks as being invariably white in colour. that the dogs which guarded the sheep were white in colour. writers are still with us today.. Most of the little shepherd dogs come in brown, grey, or grizzled coats. which were used primarily, as protectors of the flocks. Horand and Hektor are the same dog. genetic pool within the colour variations of the German Shepherd. in colour. Greif was again to be exhibited at Hanover, this time in 1887.
exhibited. At the Cassel Show in 1889, Greif II, also a white, was exhibited. the Master ofHounds of Beyenrode, Baron von Knigge. Almost identical information on Greif and Greifa is provided in The German Shepherd Dog, Its History, Development and Genetics, by M. B. Willis, B. Sc.Ph.D. identified as a genetically expected colour within the breed. would carry the white genetic factor in their gene pools. Yes. The White Shepherd has not been mixed with any other breed of dog from the time of its introduction to North America. Certainly, there has been no other breed or breeds added in order to make them white. The gene that controls the white color is a natural component in the total color genetic makeup of the German Shepherd Dog breed. The White Shepherd is registered independently with the American White Shepherd Association in the United States of America. Effective May 1, 1999, the White Shepherd was also fully recognized as a separate breed of dog with the UNITED KENNEL CLUB (UKC). UKC is the second-oldest all-breed dog registry in the United States and the second largest in the world. For more information, please contact UKC: 100 E. Kilgore Road, Kalamazoo, MI 49002. The phone number is: (616) 343-9020. The United Kennel Club can also be accessed on the Internet. ARE WHITE SHEPHERDS ALBINOS? WHAT ABOUT PIGMENT? No. The White Shepherd should have dark (preferably black) skin pigment. The nose, lips and eye rims must have color and be completely filled in. The skin of the entire muzzle may be dark as well. This dark skin will often show through the sparse coat on the top of the muzzle. It is commonly believed that all albino animals will have milky or chalky white skin pigment, light eyes with pink or red pupils and colorless, white hair such as you might see in the common lab mouse. In many species, including humans, albinos do exhibit these physical characteristics. However, today we recognize cases where albinos will exhibit colored (non-white) coats and blue eyes. (The so-called "white" Doberman Pinscher is such a case.) They are properly known as "Tyrosinase-Positive" or partial albinos. For this reason, any White Shepherd that may appear with blue (or pink) eyes or with a total lack of skin pigment is disqualified by the Breed Standard and should never be used in any breeding program. OKAY… IF THEY’RE NOT ALBINOS, THEN WHY ARE THEY WHITE? The coat color comes from a simple recessive gene. To put it plainly, in order to produce a white puppy, both parents must carry the gene for the white coat color. The white gene is not associated with the genes that cause color-paling in the German Shepherd Dog, since those genes are located at different loci. It is probably possible that a solid white GSD could carry these dilution genes. However, since the dog is white in color, the paling factor would not express itself in the color of the coat. All white German Shepherd Dogs are homozygous for the gene pair responsible for producing the color white. If we call the white gene ‘w’, then all White Shepherds must have the following genotype: ww. (A non-white dog would have to be either WW or Ww.) If we breed our white dog, the only gene it would be able to contribute to its offspring would be the recessive w. You may have heard the term "phenotype" which describes the physical appearance of an animal. Thus, the phenotype of a GSD that inherits the ww gene pair will be that of a solid white dog. The problem with the phenotype is that what you see isn’t always what you get. In many cases, you can’t tell a given dog’s genotype just by looking at its phenotype. For example, a black and tan dog could be homozygous for non-white (WW). Such a dog would be unable to produce a white puppy, even if bred to a white dog because it doesn’t carry the recessive white gene. However, a black and tan dog could be carrying the gene for solid white (heterozygous for the white gene pair) and you would never know it just by looking at him (his phenotype) because the dominant W ‘covers up’ or takes precedence over the recessive partner gene. A colored GSD that does not carry the recessive w (homozygous for W) bred to another homozygous W partner will produce a litter of non-white, non-carrier puppies. Likewise, two white GSDs (homozygous for w) bred together can never produce a colored puppy. We can use a simple punnet square to determine the probability of producing white offspring from a white parent x non-white parent if we know the genotype of the non-white dog. In the first punnet square, we see the potential result of breeding two carriers together. (We’ll define a carrier as a non-white dog that carries the white gene, also known as white ‘factored.’) With this mating, there is a potential for 25% of the resultant litter to be white (ww), 25% to be homozygous non-white (WW) and 50% to be heterozygous non-white (Ww – carries the white factor). In example 2, we mate a carrier (white factored or Ww) to a white partner (homozygous ww). The potential exists for half the litter (approximately 50%) to be white while the other 50% will be white factored (heterozygous) like their non-white parent. In the third example, we breed a homozygous non-white dog to a white partner. None of these puppies can be white but all of them have inherited the white factor and can produce white when bred to another carrier or to a white partner. In the fourth example, we breed a white factored dog to a homozygous non-carrier. Again, none of these pups can be white but half of them (approximately 50%) could potentially carry the white gene. The other 50% would be homozygous non-carriers. The only way to tell whether a given puppy has inherited the white factor would be to do a test breeding to a white dog. If no white pups result, then you would know that the parent is probably a non-carrier, or homozygous for WW. This information taken from the American White Shepherd Assn. © 2006 Karen Carloni - American White Shepherd Assn. A white (or very light), but not albino, version of the German Shepherd has also always occurred, but was designated a disqualifying fault in the American Kennel Club during the late 1960s. The breed line originated from a white shepherd dog. It is important to note that the Nazis took the SV (German Shepherd) breeding program away from Max von Stephanitz and then outlawed the white coat color. The white shepherd is recognized as a separate breed by the International (FCI) Fédération Cynologique Internationale since 2002 and by the United Kennel club for several years. The white coat, however, does not prevent the white-coated German Shepherd Dog from being registered in the AKC as a German Shepherd Dog. White Shepherds hold champion titles in the UKC (United Kennel Club). Reputable breeders selectively breed White Shepherds sound temperament, physical structure, striving for a Shepherd that closely resembles the original dog; less angular than today's AKC German Shepherd breed standards. See the American White Shepherd Association for more detail on the standards for the white shepherd or for white German Shepherd dogs see:WGSDCA The white German Shepherd has been recognized by some organizations under the name Berger Blanc Suisse (or White Shepherd Dog).